"To extend a virtual platform to enhance client's business using technology, product knowledge, logistics while focusing on building transparent & trust worthy relationships." Steelez is based on fast, latest and secured internet technology. Steelez promises you the benchmark price of your material through enhancement of market network. We handle all activities till receipt of EMD by the Seller and the auction is conducted on date and time agreed by Seller and as per his terms and conditions. SteeleEZ Customer delight is a term used to describe the feeling by customers when their Expectations are anticipated in advance and fully satisfied. SteeleEZ Customer delight is a term used to describe the feeling by customers when their Expectations are anticipated in advance and fully satisfied. Customer delight attracts more customers and also helps in keeping the customers that you already have. To extend a virtual platform to enhance client's business using technology, product knowledge, logistics while focusing on building transparent & trust worthy relationships. eTransportation Engine: "We would like to express appreciation for the remarkable services rendered by SteelEZ as an active and dynamic service provider in the field of conducting online reverse bidding for our transportation system of Gandhidham (Gujarat) plant The Services SteelEZ rendered to the Indian Steel Corporation Ltd. since 2010 have indeed been very valuable and are worthy for cost & time savings to be followed by others. We wish SteelEZ a lot of success." 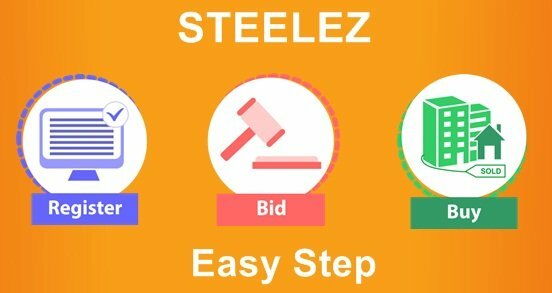 Forward Auction Engine: "The Success story of Steelez is abstract of Enthusiasm, Continuous hard work and long term thinking, that's tempts Indian Steel to have such prestigious business relationship" Hope this business relationship brings colors of success and sturdy relation of us. "During the past 3 years HEG has worked directly with the operations team of Steelez on multiple auctions. 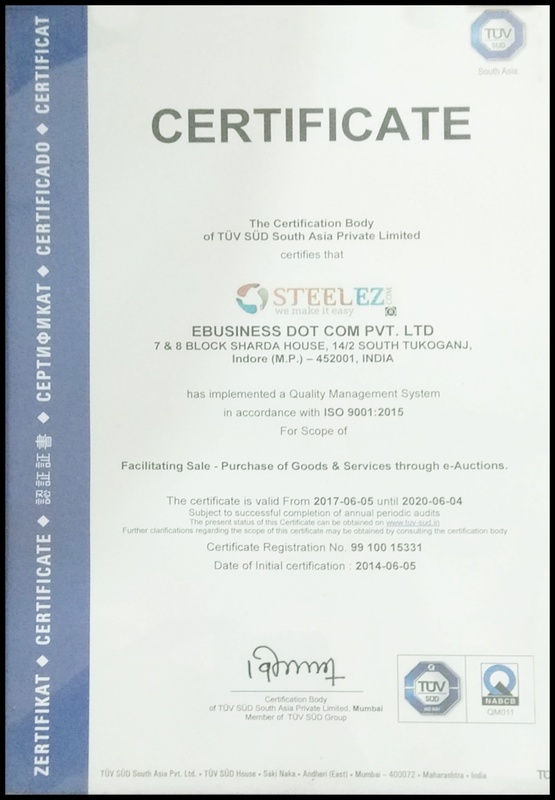 The Company E-Business Dot Corn Pvt Ltd under which Steelez performs has given us satisfactory service and good number of buyers on most occasions, which resulted in successful auctions.We have found Steelez team to be methodical and responsive and wish them success in their endeavors." "We are happy to provide a reference letter for Steelez an auction firm that we have worked with more than 2 Year. This is respectable company which runs its business with integrity and skill. From listing the auction details like planning the auction day and details and coordinating and honest manner. They have been forthright in their dealings. Their business practices saved me money and time compared to normal disposal methods. I have no Complaint about them." I would like thank to E-Business dotcom Pvt ltd on behalf of Caparo Team for giving best support and help always. "Our company RSAL Steel Private Limited has known steelez.com and recommends them for the following reasons. They reach out to the maximum number of genuine buyers. Instead of Having one solution that applies to all they reach out to specific buyers in Specific Ways, like smaller lots, multiple pictures and all approval letters to see that the process if clear for all. They have a good team of operations support that keeps the auction live with multiple bids. They don't take more time from us than the minimum needed. Their professional services are of the highest standards. There is transparency and integrity of deals. Their pre auction support, specifications, advertisement, documentation is good and post auction arrangement for hassle free pick up is good. Their value added services like informing us of market trends through email and keeping us updated about anything that influences the sale of the RSAL Steel has been good. They have clarity and simplicity of info that is practical. They have been in business since 2005 and have been successful. They follow good business practices like confidentiality and take the reputation of the seller into consideration. Highly recommended. Please feel free to contact me for further clarification." "We are happy to provide a reference letter for steelez.com an auction firm that we have worked with more than 1.5 yrs. This is a respectable company which runs its business with integrity and skill. From listing the auction details like planning the auction day and details and coordinating the post auction services like dispatch and payments their firm ran business in a straightforward and honest manner. They have been forthright in their dealings. Their business practices saved me money and time compared to normal disposal methods. They have good clientele and I have not heard any complaint about them." 1. E-auctioneer Steel Ez is conducting tender in MSIL through their business model of E-auction since 2008 in MSIL successfully. 2. Performance of the party is very good. 3. Party is having good market knowledge, good buyer relationship. 4. In every tender party tries to add new customer to generate competition. That provides optimum price benefit to the seller. I wish all success to the E-auctioneer Steel Ez. Our Company JINDALSAW LIMITED has known Steelez.com and recommends them for the following reasons. They reach out to the maximum number of genuine buyers. Instead of having one solution that a ppliesto all they reach out to the specific buyers in Specific ways. Like smaller lots, multiple pictures a nd all approval letters to see the process is clear for all. They have a good team of operation support that keeps the auction live for multiple bids. They don't take the more time from us than the minimum needed. Their professional I services are of the highest standard. There is transparency and integrity of deals. Their pre- auction support, Specifications, Advertisement, documentation isgood and post auction arrangement for hassle free pickup isgood. Their value added services like informing us of market trend through email and keeping us updated about anything that influence that sa le of the JSL has been good. They have clarity and simplicity of info that is practice I. They have been successful in business with us since June 2015. They follow good business practices like confidentiality and to ke the reputation of the seller into consideration. Highly recommended. Please feel free to contact mew for further clarification.